The Big Wobble: September devastation! After Hurricanes, Cyclones, Floods, Massive Quakes and X-class flares: Volcanoes around the world are starting to rumble! September devastation! After Hurricanes, Cyclones, Floods, Massive Quakes and X-class flares: Volcanoes around the world are starting to rumble! September 2017 will turn out to be the most catastrophic month in recent history with 4 category 5 hurricanes in the Atlantic, two tropical cyclones hitting China and Japan, devasting floods in India and Bangladesh with all the above resulting in more than 50 million people being evacuated. Add to that a mag 8.1, the biggest earthquake this year and a devastating mag 7.1 both in Mexico. We also had 4 massive X-class flares, the biggest, an X9.3 being one of the biggest ever recorded. Well, now the volcanoes are getting in on the act, all around the world reports of tremors, volcano activity, ash and steam clouds escaping as they become restless. 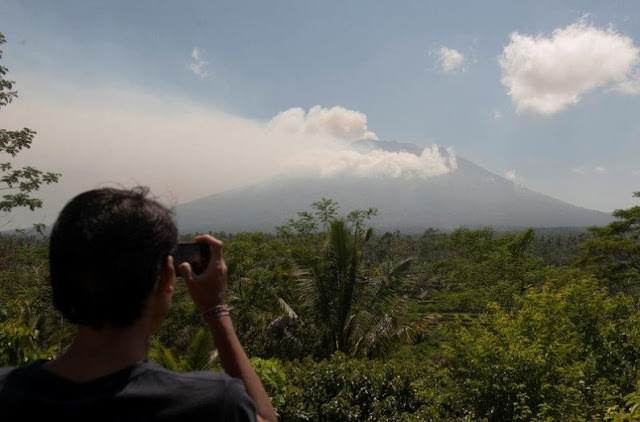 This week, Mount Agung on Indonesia's Bali island was ramped up to its highest alert level, with thousands evacuated leading Bali's Governor to claim: "This is a natural disaster, we cannot avoid, we can't stop it exploding"
The last time this volcano erupted was in 1963 killing more than a 1,000 people and injuring thousands more. The volcanic alert level for Manaro Voui volcano on Ambae island was raised to the second highest (4: "moderate eruption") on Vanuatu's scale of 1-5 this Saturday, as the activity intensified gradually over the past weeks. A vent in or near the caldera lake Voui has been producing mild ash emissions over the past weeks, but these have now become stronger and for the first time lava glow also was observed, suggesting that the eruption is transitioning from phreatic (steam-driven) to magmatic (arrival of fresh magma). According to local press articles, authorities in Vanuatu are preparing to evacuate up to 5000 people from the island's most exposed areas to safer locations. After a month of sorrow, yesterday, Mexico's colossus Popocatepetl volcano erupted ash and gas into the sky after three major quakes and massive devastation has hit the area this month. According to the National Seismological Centre in Mexico, there were three tremors, measuring on the Richter Scale 6.1 at 7.52 am, 5.2 at 8.24 am and 5 at 8:25 am. The 14,000-foot snowcapped volcano Mount Rainier was this week the latest American "Super Volcano" showing unrest after tremors hit the active volcano. Also this month The U.S. Geological Survey says a strong magnitude 5.3 earthquake rumbled through southeast Idaho, just 60 miles south of Yellowstone National Park. The USGS reported four separate quakes in an area about 63 miles from Pocatello and 130 miles from Salt Lake City. The largest quake at magnitude 5.3 struck just before 6 p.m. local time. The USGS said a handful of smaller quakes followed for about an hour. An ongoing earthquake swarm at Yellowstone volcano is now one of the biggest ever recorded, with over 2,300 tremors since it began in June. A Volcano Eruption on Fernandina Island in the Galapagos of Ecuador. After eight years of relative calm, this volcano began generating a column of water vapour and magmatic gases that were about four kilometres high. Earlier this month The Vanuatu Meteorology and Geohazards Department is warning tourists and aviation centres of increased volcanic activity throughout the island group. Meteorologist Esline Bule says tourists must stay at least at least three kilometres away from volcanic craters and the Volcanic Ash Advisory Centre in Wellington is being kept updated in case flights need to be diverted around ash plumes. She says volcanic ash has already affected some villages on Ambae but the Disaster Management Office has not ordered any evacuations. She told Jenny Meyer the islands of Ambrym and Ambae are currently the most active but Lopevi is also now starting to awaken. In Vanuatu, at the moment we are closely monitoring Ambae volcano, Ambrym volcano and Manaro Voui volcano.